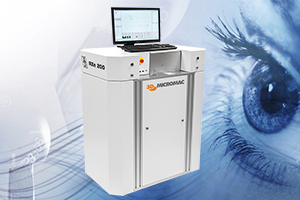 3D-Micromac AG, the industry leader in laser micromachining and ophthalmic engraving solutions, introduces the new laser system solution microMARK MCF RXe 200 for marking of blocked lenses. 3D-Micromac‘s microMARK MCF RXe200 is a premium quality marking device for all kinds of blocked lenses. Equipped with an Excimer laser including an optimized optical components setup and a large-sized magnification ratio this new generation of RX marking devices offers an increased depth of focus at lowest laser power operation on all materials. The new system is the ideal solution for semi-visible marking of spectacle lenses. Branding functionality for unblocked lenses and a full automated handling system are available on request. Customers benefit from low investment and operating cost in combination with unmatched engraving quality on any available material. This new generation of excimer laser systems was developed by Angermann Systems in cooperation with 3D-Micromac. The microMARK MCF RXe 200 systems are available immediately with short term delivery times and world wide professional service. Founded in 2002, 3D-Micromac AG is the industry leader in laser micromachining, delivering powerful, user-friendly and leading-edge processes with superior production efficiency. We develop processes, machines and turnkey solutions at the highest technical and technological level. 3D-Micromac systems and services have been successfully implemented in various high-tech industries worldwide, including photovoltaic, semiconductor, glass and display industries, micro diagnostics, and medical technology.